Sooner or later everyone goes to Chinatown... to visit Count D and his wonderful Pet Shop! For anyone who has watched the Twilight Zone, Alfred Hitchcock Presents , or Tales from the Crypt , Pet Shop of Horrors will be very familiar. Like those other great anthology shows, PSoH features darkly ironic morality tales, each one featuring different characters and a twist ending. What makes PSoH unique and very charming is the framework that surrounds the tales. Each episode is tied to Count D's Pet Shop and each resulting death is investigated by detective Leon. So we actually get two shows in one: a horror anthology, and a detective thriller. Count D, the pseudo-narrator for the series, is one of the most interesting characters in recent anime. At first appearances, the kimono wearing Count looks more like a Countess. He's one of those rare male characters that even a guy would call beautiful (as long as his guy friends aren't around to hear him say it). Just how much the Count knows about the outcome of his sales is a mystery that is never fully answered. Before selling a magical pet, the buyer must sign a contract agreeing to certain terms. These terms seem designed specifically for the buyer to break. Does the Count mean to teach these people lessons, or is he, as he says, just selling love and dreams? Leon is the cocky detective who is quick to blame the Petshop for a recent string of bizarre deaths. While he never really understands what's going on with the Count, he is smarter than he looks with 80's rock star outfits. Despite his brash accusations, Leon forms a unique friendship with the Count, and the two often share tea and sweets (the Count's look of glee at seeing sweets is priceless!). As each episode has a very surprising ending, I don't want to give away too much of the plot. Rest assured that you and your friends will be debating exactly what happened in PSoH for some time to come. Urban Vision proudly declares that PSoH was created by the "Anime Dream Team" of Hisashi Abe, Rintaro, and Yoshiaki Kawajiri. Well, it's a wonderful looking series, but hardly the brainchild of those three legends. The character designs are done by Hisashi Abe based on the manga designs, and they are wonderful. Rintaro's short opening animation is really nothing to brag about. 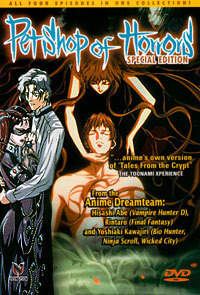 Yoshiaki Kawajiri did storyboards for one episode. Most of the credit deserves to go to director Toshio Hirata and OAV writer Yasuhiro Imakawa. Animation uses minimal frames, but the detail and camera techniques make up for the lack of fluid movement. The colors and slow pacing, combined with the haunting music, all add to the creepy tone of the series. I first saw PSoH on dubbed VHS and fell in love with it with the American voices. Now that I have watched the subtitled version, I must say that I think the American dub features superior voice acting to the original, at least for an American viewer. The dub voices add a little more comic tone to Leon and the Count, but it really works and greatly adds to the enjoyment of the series. The lip-syncing is phenomenal; Urban Vision shows once again that they can do dubbing justice. The script rewrites for the dubbed version are also better written than the subtitles. It may be less accurate, but it is does a much better job at allowing the reader to get into the stories, and isn't that, after all, what's important in anime? The DVD extras are rather sparse, but appreciated. The "Never-Before-Seen Deleted Footage" is really just the Japanese music video opening animation. Trust me. It's hideous. I'm glad Urban Vision dropped this and used the classy opening that begins the VHS tapes. The audio commentary by the English director and cast is very informative. The director, who also did some of the rewrites, gives one of the best defenses of dubbing I've ever heard, and after watching this DVD, you might just believe him. If all dubbing was done this well, perhaps it wouldn't have such a bad reputation. My only complaint with PSoH is the fact that madhouse animated just four epiodes. The original manga by Matsuri Akino featured 40 episodes, and after seeing these four, I am eager to know the rest of the stories. The four episode OAV is self contained, but by no means does it have a sense of conclusion to it. I haven't heard anything about more episodes being animated, but I sincerely hope Madhouse picks this show up again. As it stands, this DVD edition is the perfect introduction to the Petshop and deserves to be part of any horror anime fan's collection.